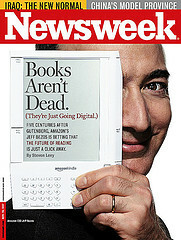 I bought a Kindle on Monday (see Amazon, CNet). It arrived on Tuesday. Here are my impressions. At $400, it is more expensive than the Sony EReader, but the Kindle has wireless (free EVDO) access to the Amazon store so you can buy books while you are away from your computer and start reading them in a few minutes. You can send email to your kindle with attachments. In my experience, so far, the experimental PDF conversion (10 cents per document) works really well and even keeps links. As expected, the electronic ink is much more relaxing to gaze at than a computer screen. The delay caused by refreshing the screen when you turn pages is not too much of a disruption if you are reading every word. However, it makes skimming impossible. For this reason, I don’t think I’ll be able to read my RSS feeds on the Kindle, only articles, books, etc. It is oddly shaped, yes, but it’s light and comfortable to hold. I’ve only read a portion of a book so far, but I’ll report back here when I’ve completed it. So far, it’s great. I haven’t used the clipping, annotating and highlighting features, yet, but I’m glad they are there. You can download samples of any book in the Kindle store (90,000+). This is great for reading the first chapter of books you are interested in at your leisure (not at a book store). If you choose to purchase, you can do so while reading the sample and have the full book in a couple of minutes. I’ve already used the browser with Wikipedia several times. I think that’s going to be a hit with a lot of people. I do wish that more text could fit on the screen and that the screen itself had a frontlight for reading in the dark. Amazon recently introduced a feature called Product Previews for people who are using their Associates program. It’s pretty cool. Amazon Associates is Amazon’s affiliates system where sites link to Amazon products and banners with a special id in the url which gives the Associate a share of the profits from the sale of the linked products. With Product Previews, links to Amazon can now have rich popups when the links are moused over. The popups contain a product image, a buy now button, review information, etc. Note: you can move the preview window around. Doing that will ‘pin’ it to the page until you hit close. For instance: Naked Conversations (book), Tron (dvd), Palm TX (pda). During this beta period, only 50% of visitors to your pages will actually see the Previews – this is so Amazon can see if it’s helping or hurting business. The code snippet to add the Amazon Product Preview to your site is here: snippet.txt. The official docs are here. How many DAYS does it take to receive a DIGITAL E-BOOK from Amazon? I purchased an ebook last night(pdf) from Amazon. Here I am 24 hours later and the ebook is still not ready for download. My order info says “Open Order — Being Processed”. I used their click-to-call help service twice today to find out why I should have to wait ANY amount of time for a digital download. So far, no luck. (as seen on Make) Finally, someone integrated A9 Street-Level Photos and Google Maps. Of course, Google will be adding their own street level photos soon enough.